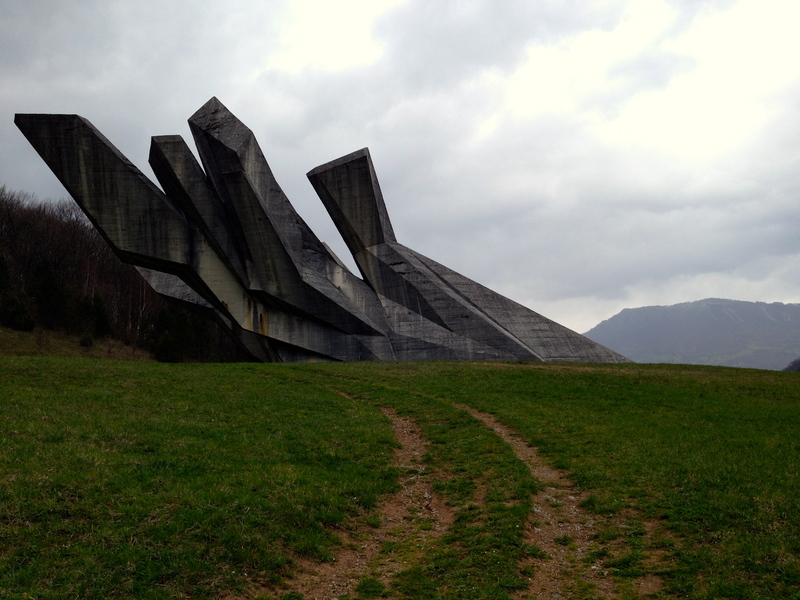 Photos of “Yugoslav space age monuments” have been all over the internet in recent years, entirely decontextualized from both their original and evolving meanings. Susanna Bitters takes a closer look. Walking up the steps of Tjentište, the monument disappears before it reappears again. The sloping hills that compose the careful site lines concocted by an unknown artist hide the monument for a moment, nestled in the ascent. You can almost forget it’s there. This magic trick is not just limited to the physical. 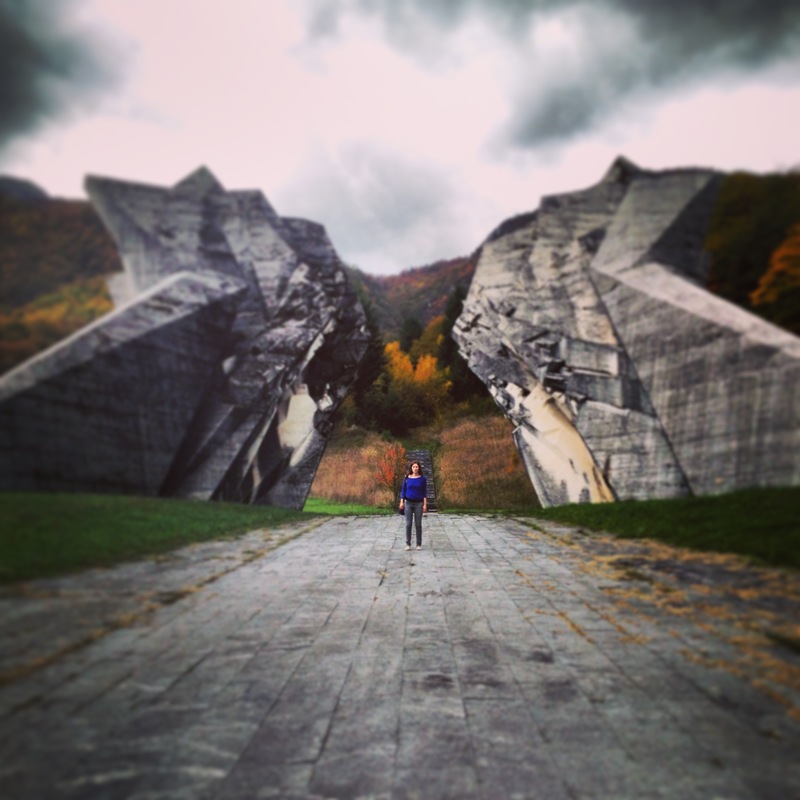 In the Internet age, Partisan monuments, or spomenik, have become as scattered across websites as they have across the Balkans. The presentation of these “space age” marvels depict only their futuresque and crumbling qualities. The bloody memento mori of their origins have become omitted, if they were even known in the first place. The spomenik have effectively receded from the landscape as markers of the Partisan socialist struggle, only to emerge again as beacons of a Brutalist, over­reaching, and unrealized future. At the end of WWII, thousands of spomenik were erected. A majority of them were situated on battle sites, creating a consciously­ constructed constellation of Partisan struggles across the landscape. They remain scattered across the region, some as simple as a plaque with the names of those killed. You can find them still, tucked onto hilltops and occasionally marked from the road by brown government signs. The early sculptures were representative and, quite frankly, exceedingly dull, telling a careful story in stone and iron. They showed the pores of a post­war world. The subject matter was severe, the construct depressing. Metal men seemed to sag and fray under the sheer weight of time and death and loss. 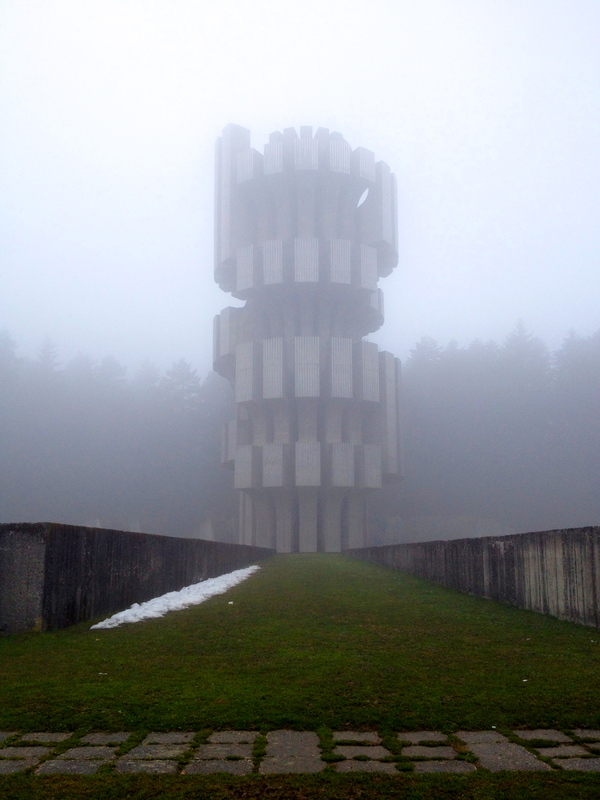 But when Tito turned from Stalin and cast his gaze on the west, so did the Yugoslavian spomenik. Within the length of the Informbiro Period began the rise of what was later termed “socialist modernism,” in which the horrors of war became an abstraction. The long, laconic, and notionally weary faces looming above the elevated platform at Tjentište, discernible only to the practiced eye. The rapidly shifting sun when ensconced at Kozara, vacillating wildly from dark to light as if to depict the mercurial nature of humanity. 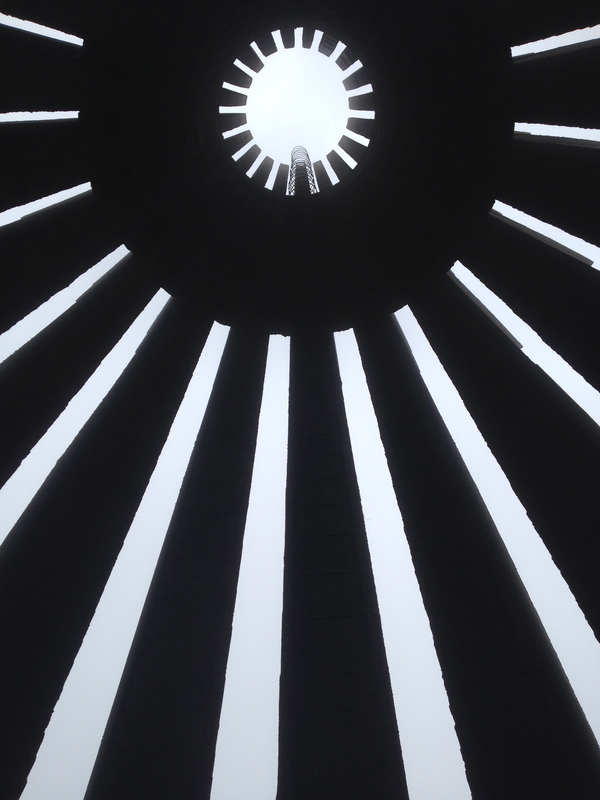 The spomenik began to depict not war and conflict, but the struggle for self-­determination and the optimistic energy therein. 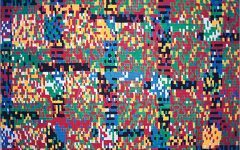 Yugoslavia sought to find its own political, cultural, and aesthetic identity distinct from that of the Soviet Union, and the spomenik that rose from the concrete bones of this period embodied an inclination for universalism, liberalism, inclusionism, and the utopian possibilities of a modernist future. This new ideological system became closely linked to the concepts of abstract modernism, juxtaposed against the discarded socialist realism. The monuments spanned the space of ideology and art, incorporating a sweeping universality that reflected the political discourse of the day. 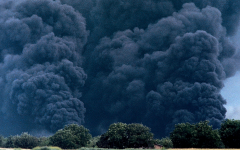 What emerged from the remnants of the Yugoslav socialist world was, as Susan Buck­-Morss described it, a “socialist dreamworld.” That dreamworld was the foundation upon which Yugoslavia was built. The constructed memory of the Yugoslav Communist Party was perched upon tenets of modernism, industrialization, and the dream of the utopian socialist future. Each spomenik served to join the promises of the socialist revolution to the memory of WWII, while denying the social and historical context. The dream was buffeted throughout the 1980s, however, having failed to account for or address the economic insecurities, nationalism, and assassinations of the era. And so it was those very same wounds, never fully healed and long ignored by the Communist Party, that ruptured once again in the cataclysm of the 1990s civil war. 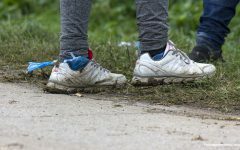 In the modern states that made up the former Yugoslavia, the sites have often become nearly completely decontextualized by the shifting ideology of the post­communist era. 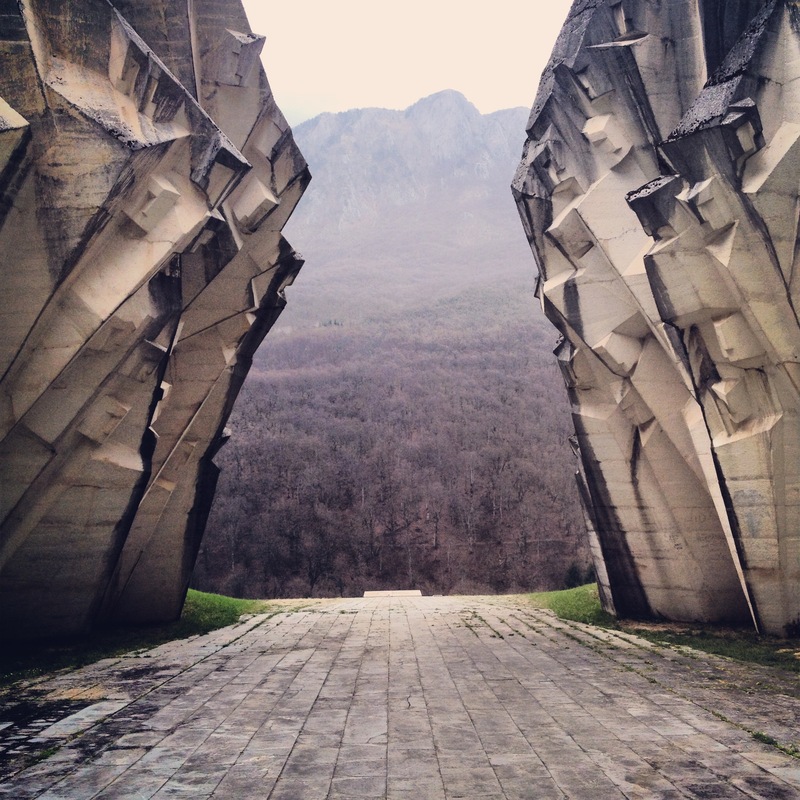 While the nationalist rhetoric of WWII had reasserted itself on the landscape, the Partisan spomenik barely seem to acknowledge the reality of what happened at sites of memorialization.​ T​he sites that once turned away from the past and instead looked to an all-­embracing universal socialist future now appear to look nowhere at all. Those spomenik that have been successfully reconfigured into new nationalist narratives have survived, while others have perished. 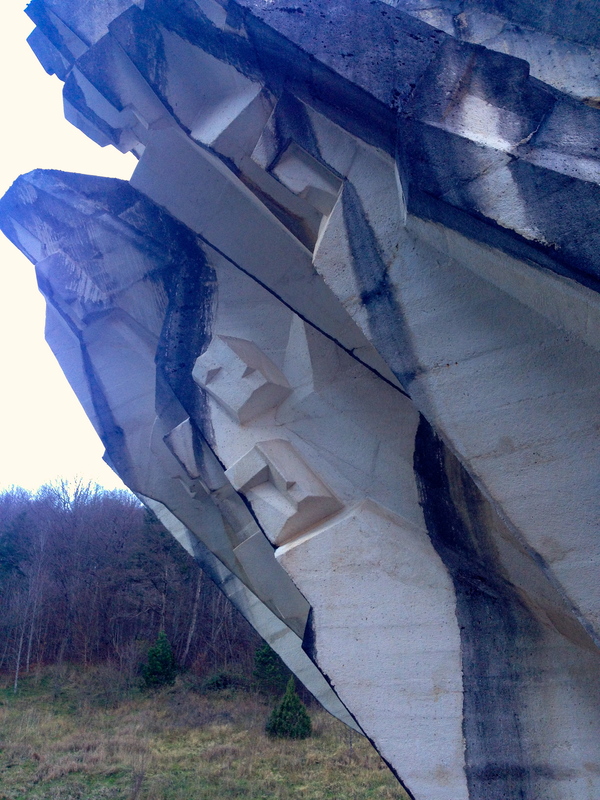 Across Croatia, anti­fascist spomenik were deliberately destroyed. 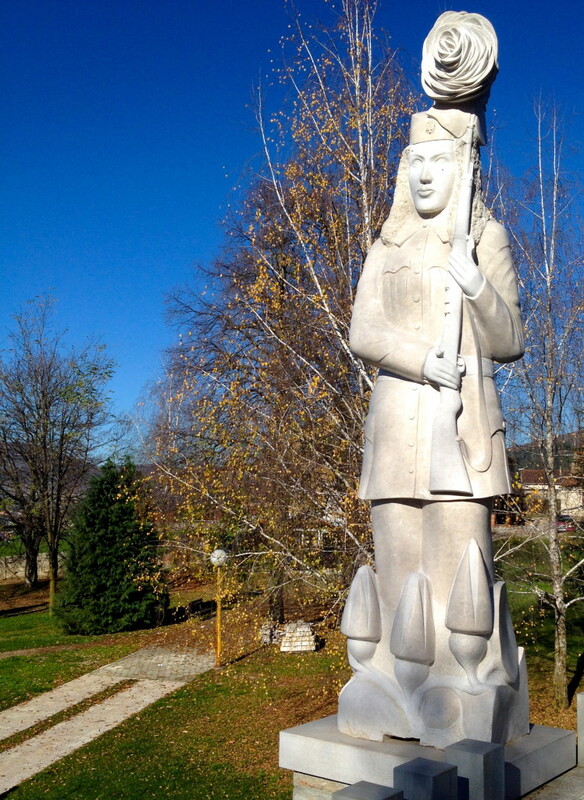 A Partisan spomenik in Bileca, southern Bosnia and Herzegovina, was razed in 2012 to make way for a monument rehabilitating the Chetnik image, projecting Chetnik fighters as peaceful protectors with flowers in their rifle muzzles. The majority of spomenik have been left to crumble, however, rendered into beautiful, ambiguous, and nearly invisible objects. Stripped of their ideological foundation, the spomenik have disappeared as representation of political power and emerged again as pure art frozen in time. The objects remain evocative though, harkening to a distant star. They serve as witnesses of a broken promise, a specter of the past that still haunts the present. The first time I came across one, it was an accident. I was driving with a friend from my home in Sarajevo to Montenegro, drifting and sifting our way south. We came around a bend, and there it was. 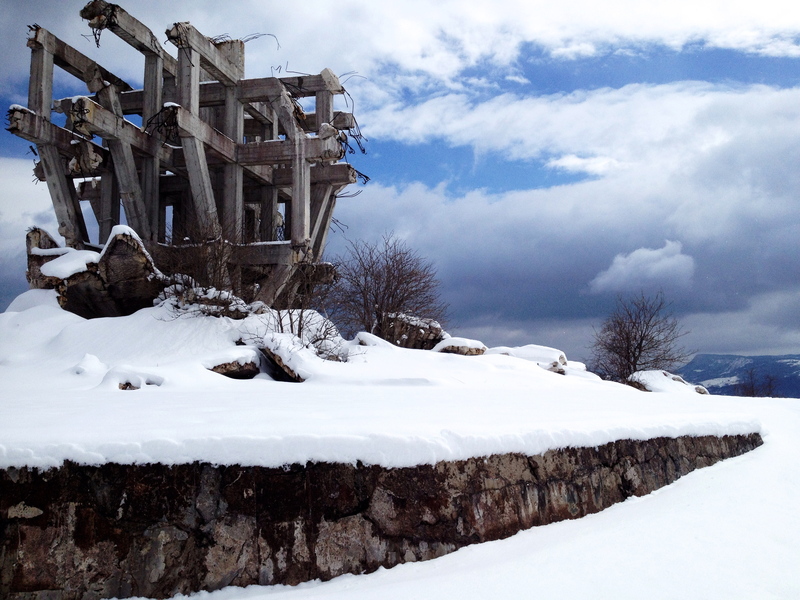 Miodrag Živković’s Valley of Heroes was constructed in 1971, in the full swing of socialist modernism. The monuments marks the historical battle of Sutjestka, a month­long bloodbath in which Partisan soldiers fended off the advancing Germans, Italians, and quisling troops. Marking the site, concrete juts out off the ground like the shattered bones of a futuristic and fantastical giant. The details of such monuments are often lost. While photographs of many of the sites can be found on design blogs, the locations are rarely, if ever, noted. 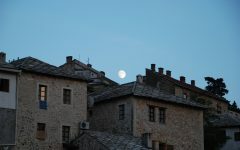 Sites such as the Bosnian Commission to Preserve Historical Monuments ​provide the names and general vicinities of monuments, but often lead to empty sites. Despite my best, and oft repeated efforts, I never found the necropolis of Vareš. When I did find the Makljen spomenik, it was stripped to its struts. The evocative nature of the monuments remain, although their physical structure may soon be relegated, like Yugoslavia, only to memory. 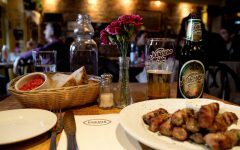 Susanna Bitters is a former Sarajevo resident and an avid Balkanophile. Originally from Illinois, she attended the University of Illinois Urbana-Champaign and the University of Chicago.